We are well-known enterprise instrumental in processing highly effective grade of Ammonium Iodide. We bring forth the non-toxic chemical that is trusted widely for its accurate composition and industry compliant chemical compounds. 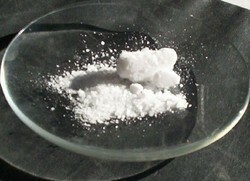 We leverage the innovative chemical processing techniques and prepare the much-anticipated chemical by the action of hydroiodic acid on ammonia. Carefully processed under strict quality supervision the offered chemical is accessible in moisture-proof packaging at a leading price. Looking for Ammonium Iodide ?